A baby’s birth is a matter of celebration and happiness. The baby is precious for us and we will fight everything to protect it. We protect them from the weather, diseases and a host of other things; sadly at times we forget a few vital but small protection care tips. One such small but vital product is a bottle sterilizer. As a new mom, if you are breastfeeding and expressing milk or using formula milk, you will need baby bottles to feed and store the milk in. These bottles need to be extremely clean and sterile otherwise they will end up being a carrier of bacteria which can make the baby really ill.
Apart from the bottle, many babies put pacifiers in their mouth. Sterilizing them will also help in non-transfer of bacterial infection. With the current advancement in technologies, we don’t need to keep bottles in huge pans with boiling water for sterilization. Such methods are a waste of time, energy with far from perfect results. How does a bottle sterilizer work? A bottle sterilizer works on a simple principal. It has a small water compartment, where the water is heated and converted into steam. This steam cleans the bottle and pacifiers from outside as well as the inside. Remember you need to keep washed and wiped bottles in the sterilizer. What kinds of Bottle Sterilizers are available? Microwave bottle sterilizers are handy to carry. These can be kept in a microwave and most of them can fit any size bottles. However there are a few limitations when it comes to microwave bottle sterilizers. You need to keep a watch while the bottles are being sterilized to avoid any untoward incident. These sterilizers cannot sterilize any metal items and hence if you use metal spoons or your babies’ favorite chewing toy has a metal edge; it cannot be sterilized in the microwave sterilizers. If you are travelling to smaller cities in India, you might not find a microwave readily available in hotels. Steam Bottle Sterilizers are by far a much safer option. This is a stand-alone unit and once the bottles are sterilized in it they can stay bacteria free for around 24hrs. As these don’t use any kind of chemicals to kill bacteria’s, it is as simple as plug-in and use. Some bottles sterilizers like Peter Fighter Baby Bottle Steam Sterilizers come equipped with an automatic shutdown in case of low water levels. Look for standard safety and precautions that are available in the product. An internationally certified product with ISO9001 and ROHS certifications are the best. Products that have options of quick sterilization can help. Things never go as planned with small babies in the house, having quick solutions to ensure that the baby gets sterile bottles every time. Having a sterilizer that can sterilize more than 2 bottles at the same time helps when you wish to refrigerate expressed milk. This also means that you don’t have to sterilize the bottles 5 times in a day. Energy Saving bottle sterilizers are not only good for our pockets but also good for the environment. Understand the volt requirements of the product and those prevalent in your country. 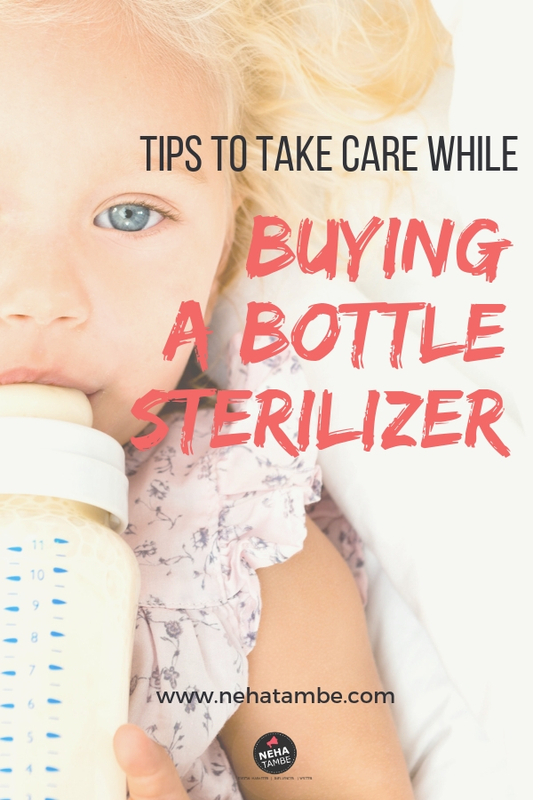 Did you use sterilizers for your babies bottles? What are your tips and suggestions for new moms looking to buy a bottle sterilizer? My baby is 2 now but I haven’t yet used a bottle sterilizer. In fact I got all the necessary information from your post! These are excellent tips Neha. and I agree when it comes to baby products we should take extra care about the safety standard. also, the idea of energy saving sterilizer is so good. your post will help a lot to the parents to choose a correct one. Thanks for sharing your Detailed insights on sterlizers. Really a helpful guide for all the parents. My son took bottle for around a year anf honestly having a sterilizer was a saviour to me. Thanks for these tips. These are some really very helpful and informative post for the moms. I had no clue about this. Thanks for sharing this information with us. back in time when the twins were little i had actually considered bottle sterilizer but wasnt sure if its worth it. This blog is helpful. Though I do not use bottle sanitizers yet I beleive it is very important for kid’s health to use one…I will share it in my circle now…. Thanks for sharing detail insights Neha. When it comes to sterilizers or infact any baby product , One should be really careful about safety standards. Very nicely written post. Sterilisation is so important and good to see an easier way of doing it. As I haven’t used bottle sensitizer yet so it’s something new for me. Thanks for sharing about this product. Would love to try this now. Bottle sterilizer is an absolute must have. My daughter was bottle fed till 1.5 yrs of age and i made sure to sterilize the bottles. It is such a convenient way to sterilize without affecting the material of the bottle. I am in for it. I was told my mother to sterilize in boiling water, but within a week’s use bottle would lose its charm. Then read about these sterlizers somewhere and we got one. The best and most assured gift you give yourself post having a baby. Bottle sterilization is important and sadly it is often ignored or not done properly. Having a sterilizer would be good and more satisfying. I had exclusively breastfed T, he never liked formulas, so while travelling I use to express BM. And these bottle sterilizers comes very handy to sterilize the breast pumps, storage bottles too. I had exclusively breastfed T, he never liked formulas, so while travelling I use to express BM. And these bottle sterilizers comes very handy to sterilize the breast pumps, storage bottles too.. I luckily not get chance to choose bottles as I was happy breastfeeding mama , would share this helpful information with all mom’s. Very important and crucial points. Though i have never used any sterilizer or bottles. But standard products are must for babies. I have used bottles to feed expressed milk and hence bottle sterlizer proved to be a boon especially while travelling. Must try product. I always look for ISO certification of any baby product I buy. Safety norms are good to follow. The steriliser is great for mums who are travelling. I used a steam steriliser by Philips for my kids until they turned 1. I think it’s an unavoidable expense and I consider it as rather an investment.